Hey after watching OCC I said "I can do that"! I bought a rolling chassis off ebay and over the next few years I got all the parts. 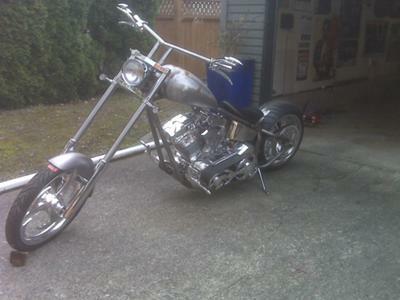 because I live in Canada I had them all the parts shipped to the border, and built this chopper in my garage. I had a friend do a bit of welding for the rear fender, my nephew did the paint in my garage. Had a few parts chromed locally and voila! I got a home built chopper. I wonder if your 'Chopper' has more horse power than my Thoroughbred or Draft/Quarter Cross? Great job! 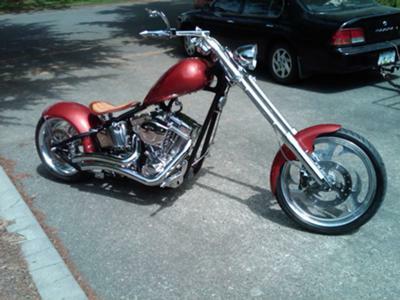 I am in the middle of a similar project using a streched Santee rigid frame, custom 2004 dyna front end and a 93 Dyna mill. I have a question for you though; as there are a few options on how to mount the rear fender (I see yours is rounded as is mine), how did you mount yours? It looks in the small photo's that you used chrome struts fixed to the rear axle? If so where did you find curved struts to fit? I can only find flat struts so far. Or did you cut them and weld a spacer then bolt them to the fender? I am interested in your reply. HEY man THATS A GREAT BIKE...I'm in the process of building a HONDA 550 chopper but due to JOB LOSS, money is TIGHT...BUT I'll GET ER DONE!!! Real good job man. Keep up the good work.